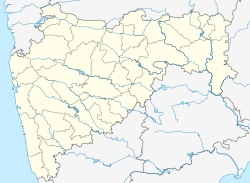 Palghar pronunciation (help·info)) is a town in Konkan division of Maharashtra state and a Municipal Council located about 87 kilometers north off Mumbai. Palghar lies on the Western Line of the Mumbai Suburban Railway on the busy Mumbai-Ahmedabad rail corridor. It is the administrative capital of the newly formed Palghar district. The town is located around 35 kilometers north of Virar and about 24 kilometers west of the Mumbai-Ahmedabad National Highway (NH 8) exit at Manor, India. As of 2011[update] India census, Palghar had a population of 68,930. Males numbered 36,523, i.e. 52.9% of the population, and females 32,407, i.e. 47.1% of the population. Palghar has an average literacy rate of 77.52%, higher than the national average of 59.5%: male literacy is 81.2%, and female literacy is 73.35%. In Palghar, 11.8% of the population is under 6 years of age. The majority of population follows the Hindu religion with a sizable portion of Jains, Buddhists and Muslims. There is also a small Christian and Sikh community. Marathi is the most widely spoken language with Varli, Vadvali and Vanjari dialects. Small communities of Gujaratis and Muslims speak Gujarati and Urdu respectively. Palghar is well connected via road and rail transport. Palghar acts as a divisional head of Maharashtra State Road Transport Corporation. MSRTC provides direct connectivity to several towns across Maharashtra including Miraj, Pune, Vaduj, Thane, Ulhasnagar, Bhiwandi, Aurangabad, Ahmednagar, Kalyan, Alibag, Nandurbar, Bhusaval, Shirdi, and Nashik. The roads are not well developed, Since it is declared as the district, transportation needs to be good. Palghar is an important railway station on the [INDIAN WESTERN RAILWAY(west side)INDIAN RAILWAY] line of the Mumbai Suburban Railway. Along with shuttle/Memu/EMU (local trains) services, many long distance trains also stop here. On 1 August 2014, Palghar became the 36th district of Maharashtra. Its history is alternate with its old district Thane. From Palghar district Jawhar, Vasai and Palghar tehsils had a golden history legacy. Vasai ( then known as Bassein ) was under the Portuguese empire. After that Chimaji Aappa captured Vasai fort from the Portuguese and embedded the Maratha flag on Vasai. Palghar was the one of the important points in 1942 of the Chalejav campaign. On 14 August 1942, there was an uprising in Palghar, in which Kashinath Hari Pagdhare, Govind Ganesh Thakur, Ramprasad Bhimashankar Tiwari, Ramchandra Mahadev Churi, and Sukur Govind More were martyrs. The main circle of Palghar is known as "Paachbatti" ( Meaning ' five lights ' ) in honor of these martyrs. The Paachbatti is situated very close to the Palghar Railway Station, which also serves as the Palghar Bus Stand. Warli (Adivasi), Katkari, Malhar Koli, Vanjari, Vadval, Mali(Sorathi), Vishwakarma Panchal are the predominant castes in Palghar. The Panchal's are belongs to Malava (Madhya Pradesh). They migrated for their business furniture making and to sold farming equipments. They first came to Gujarat and settled near Ahmedabad. After some decade's they came to palghar and Grown their business in making fishing and farming equipment as well. Their language has mixture of Marathi and Gujarati most probably called (Dedh Gujarati). The Vanjaris have their roots in Chittodgad, Rajasthan and its said that they migrated for trade and to escape the Muslim invasions into Rajputana via sea routes to Murbe and then spread all over Palghar district. Their language is quite distinct from standard Marathi as it has high influence of Rajasthani and Gujarati. Vadwal is the most numerous community present in Palghar. They are said to be the descendants of Yadava dynasty of Devagiri who escaped from the Muslims and established themselves here. They form one of the very few Marathi-speaking communities which belong to Kshatriya varna but not the traditional 96-clan ( 96 - Kuli) Maratha caste. Warli Painting and famous Tarapa dance features contribution towards art by the Warli community. Warli painting and art stretch back to a millennium. Warli art is also appreciated in foreign countries. Warlis represent the earliest settlers of the Land around the present times and their culture has largely influenced the later cultures in and around the area. The Koli (fishermen) community of Palghar is a reminder of the city's links with the Arabian sea. Fisheries form a large part of trade and diet of Palghar and also takes up major role in cultural events. The Kolis are further divided into subcastes such as Vaiti, Mangele, Bari, etc. Palghar District is world famous for it's Tribal Warli Paintings. Late. Padmashree Jivya Soma Mashe (19/04/1934 - 15/04/2018) the Father of Warli Painting was from "Ganjad", the small village of Palghar district. "Antarang Sanskrutik Kala Darpan Pratishthan Saphale" was active NGO/Trust in Saphale, working for development of Visual Art, Performing Art, Music and Conservation of Culture, Local Tribal Art. also for Social & Environmental issues. Plaghar District has also a great Culture & Heritage site for Tourism. The economy of Palghar is largely primary and tertiary sector. The emergence of Boisar as an industrial town meant reduced industrialization of Palghar. Palghar being the seat of Taluka, has lots of government offices and people working there. Also the creation of Palghar district in 2014 magnified this. Agriculture, animal husbandry, dairy and fisheries are practiced in abundance in the rural areas around the city and fuel the economy of the city. There are several animal husbandry. Due to cheaper property as compared to Boisar, many people commute daily to the sister city since they're very well connected. It is also seen to happen vice versa. Palghar had also been a hub for wood smuggling in post independence era, a practice which has been largely curbed by the Forest department and police. Other than wood, the secluded beaches were known to attract smugglers trying to offshore their goods and enter Mumbai by road to avoid customs. The town has a number of schools and colleges. A number of construction projects have recently been started in the region. There is tremendous scope to set up new schools and colleges for increasing staying population. Cricket is the most popular sport in Palghar. Local tournaments are organized at various locations across the district. Shardul Thakur is a cricketer from Palghar (Mahim) who plays for Indian Cricket team and for Chennai Super Kings in IPL and for Mumbai in Ranji Trophy. Aditya Tare is a cricketer from Palghar (Satpati village). He is associated with IPL T20 matches. He is a wicket-keeper and a right-hand batsman for Delhi Daredevils. Aditya is a well-known batsman as well as a wicket keeper. He started his professional career in 2008 when he got a chance to play for Mumbai’s domestic team. He is still associated with the same team. In 2010, Aditya was selected by Mumbai Indians for IPL and he played for Mumbai Indians till 2015 before Sunrisers Hyderabad bought him in 2016. In 2017, Aditya was bought by Delhi Daredevils. He has an impressive record of his name for most dismissals by a wicket keeper. He made this record in Ranji Trophy when he dismissed 41 batsmen while wicket keeping. Aditya has also been honored by the award of Best Mumbai Ranji trophy Cricketer. He was given this award in 2012. On numerous occasions, he also won the award for Man of the Match due to his brilliant performance during various matches. ^ "Shiv Sena Retains Palghar Assembly Seat". ^ "District Palghar, Government of Maharashtra | District Palghar". Retrieved 22 April 2019. ^ "अंतरंग सांस्कृतिक कला दर्पण प्रतिष्ठान – रंग नवे… छंद नवे…!". antarang.org. Retrieved 22 April 2019. This page was last edited on 22 April 2019, at 07:31 (UTC).